Calderonia is an experiment in biography through a blog. It tells the story of George and Kittie Calderon’s lives from 30 July 1914 to 30 July 1915 from day to day as it happened, but exactly 100 years afterwards. It therefore feels like a biography in real time. When no facts were known for a particular day, the author posted on subjects ranging from the Edwardians, recently published biographies and his own problems as a biographer, to translating Chekhov and the Commemoration of World War I. The blog-biography can be accessed in various ways. To read it from the beginning, go to the top of the column on the right and click the appropriate link. You can then read forward in time by clicking the link at the end of each post. If you wish to start at a particular month, scroll down the column on the right to Archive at the bottom. Posts can also be selected through Search Calderonia and the Tags on the right. An update on the complete biography of George Calderon always follows this introduction. 6/4/16. I have now revised 96% of my book George Calderon: Edwardian Genius. The last chapter, covering Kittie’s life 1923-1950, feels too close still (I finished the second draft only two months ago) to tackle, so I am limiting myself to re-reading the very rich material that went into its making. Another reason for the delay is that I am waiting to view some new archival material that popped up only last month in the course of my regular trawls of the Web. I hope to post about that in two weeks time. 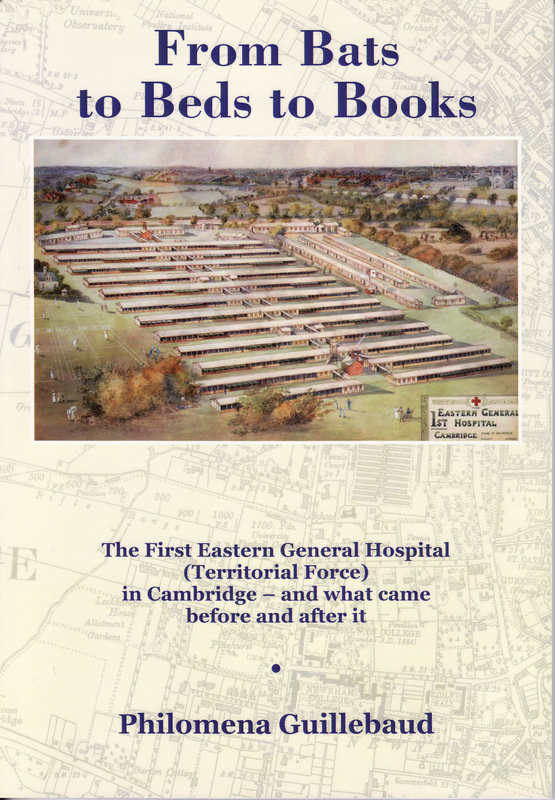 The First Eastern General Hospital (Territorial Force) was Cambridge’s outstanding contribution to the war effort, yet hardly anyone has heard of it today and there is nothing on its site to commemorate its existence. It was a huge military hospital covering ten acres on the present-day sites of Clare College’s Memorial Court and Cambridge University Library. In a breathtakingly efficient act of collaboration between colleges, the War Office, Addenbrooke’s Hospital and local firms, work began in September 1914 on the construction of twelve 800-foot long huts comprising twenty-four wards with 1500 beds and the first patients were admitted on 17 October. The facility took in wounded, injured and sick from the B.E.F., the Mediterranean Force, the Home Force and Belgian casualties. It was a state of the art hospital (‘open-air’ for two years) and brilliantly run. Over 70,000 patients passed through it between 1914 and 1919 and it had an extraordinarily low death rate. The memorial will be a large inscription hand cut by Cambridge’s Kindersley Workshop into the stonework of the outer wall of Clare College Memorial Court (this college owned most of the land on which First Eastern General was erected). The text will read: HERE IN THE FIRST EASTERN GENERAL HOSPITAL 70,000 CASUALTIES WERE TREATED BETWEEN 1914 AND 1919. It seems particularly appropriate that the inscription should be designed and executed by the Kindersley Workshop, as David Kindersley (1915-1995) trained under Eric Gill (1882-1940), who was a major contributor to the style adopted for war memorials after WW1 and cut many himself. Kittie Calderon knew Eric Gill and adopted his apprentice Joseph Cribb as a correspondent and recipient of parcels from her when he went to the Front. The full story of the hospital is told in the above book. Its title refers to the fact that the site started as a cricket field and ended as a copyright library. Between 1920 and 1929 it also provided emergency accommodation for 200 families at a time — the beginning of Cambridge’s social housing. Philomena Guillebaud’s book is another gem of British local history (see ‘Watch this Space’ 2 March 2016). Rigorously researched, it is also lively, witty, and tells a profoundly inspiring story. In historical terms I was most interested to discover how far in advance of war the ‘shadow’ Territorial Force hospitals began to be assembled (1908). As Guillebaud puts it, the opening of First Eastern for admissions within ten weeks of the declaration of war ‘was no miracle: it was a remarkable case of successful forward planning’. The leadership of the hospital, principally surgeon Lieutenant-Colonel Joseph Griffiths and matrons from Addenbrooke’s Hospital, was hugely impressive. Further proof, then, that the Edwardians were not the bumbling amateurs some may think. This book may be obtained by sending a cheque for £14.00 (includes postage and packing) made out to Philomena Guillebaud at 26 Wilberforce Road, Cambridge CB3 0EQ. From 10 April 2016, Calderonia will be moving servers to an improved WordPress site. The https://calderonia.org link will go straight to the new site, but if you have bookmarked https://georgecalderon.wordpress.com then please be aware that this will be the old version of the site and for the newest Watch this Space posts and other updates from 10 April you should change your bookmark to https://calderonia.org (which you can do now and everything will still work exactly as it should). This is the most recent ‘Watch this Space’ post. For the archive of ‘Watch this Space’, please click here. By popular request, however, the previous post remains up, immediately following this. This entry was posted in George Calderon, Personal Commentary, Timeline and tagged Addenbrooke's Hospital, Belgium, biographies, biography, British Expeditionary Force, Cambridge, Cambridge University Library, Clare College, commemoration, comments, Dardanelles, David Kindersley, Eric Gill, First Eastern General Hospital, George Calderon, Joseph Cribb, Joseph Griffiths, King's College, Kittie Calderon, Mediterranean Force, Philomena Guillebaud, Territorial Army, The Great War, World War I. Bookmark the permalink.